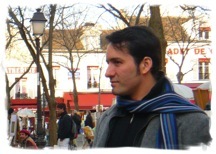 Arturo Corrales (*1973), started from his childhood music and painting. He acquires a degree in architecture as well as a first music formation in his home town, El Salvador. He concludes his studies in Geneva and Lugano : composition, electroacoustics and orchestral conducting. Price Edmund Pendleton 2004 and Master of musicology in Paris VIII. He is co-founder of the Ensemble Vortex in Geneva. Of determinedly experimental conception, its work of creation is often inspired by ethnic and popular domains. Constantly attentive to the formal coherence of his works, to the control of their projection in space and time, he wants to facilitate the expression and the perception of a "livable and human" music. Next to his activities of composer, interpreter and conductor, Arturo Corrales teaches the guitar and is the professor of composition and analysis in the Conservatoire Populaire de Genève. He prepares a doctoral thesis on the theme Musical Figures.